Cyclists on Sunday will ride safely on closed roads. But once permission for an exploratory oil drill on the route is approved, the roads will be shared with HGVs. In the last couple of weeks a cyclist died after an accident nearby – it is feared that emergency vehicles will be slowed down from accessing this area once the oil drilling starts. Europa Oil & Gas, in consortium with UK Oil & Gas, Union Jack Oil, Angus Energy and others, have conditional planning consent for an exploratory oil well at a site alongside Coldharbour Lane. 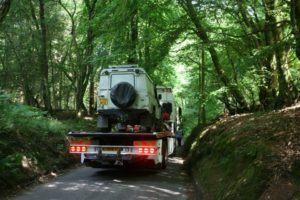 This is a narrow, winding, tree-canopied sunken lane in the Surrey Hills Area of Outstanding Natural Beauty.